I made some pretty stellar pork chops the other night. I cobbled together a preparation of sorts that I remembered from a cookbook my host family had in France using the ingredients that I had lying around, including a bottle of mediocre homebrewed beer and a jar of lingonberry preserves from Ikea. (Cooking is an excellent use for rejected spirits, by the by. As for dejected spirits, liquor can work, but it’s usually just a temporary fix.) The chops came out smashingly well – tart, savory, perfectly cooked – and I was proud to present them to DG at the dinner table accompanied by a lovely bottle of Washington Riesling and a couple of different vegetable preparations alongside. A little smug, even. As he tasted each dish, I watched his eyebrows rise in approval, and the reaction to the pork chops was sufficiently enthusiastic. Unexpected, however, was the groan of delight upon tasting the creamy cauliflower side dish. This coming from someone who claims he does not care for cauliflower. At first I was a little insulted. Did he not fully comprehend the glory of the pork chops? Was this a polite rejection? Backhanded compliment? Like when you don’t like your friend’s outfit, so you comment on her nice earrings? Before I jumped to any conclusions or got verbally huffy, I decided to do a little go-round of my own plate, and gauge my own reactions. Sure enough, the pork chops were mighty tasty, the sautéed zucchini a lovely bright note, but the cauliflower caused my eyes to roll back in my head involuntarily. Fine, I conceded. Flipping delicious. Which brought me to the following conclusion: too often I am focused on the glory of the main act of any meal, and pay less attention to the things I serve alongside. We all get stuck in ruts, and everything is served with a scoop of steamed rice, steamed veggies, boiled potatoes, or what have you. I love rice and veggies as much as the next person, but getting stuck in a culinary rut is no good for any party involved, whether you have only your mouth to feed or a dozen. At a loss for exactly what to do with the cauliflower that night, I’d gone on a quick hunt for something simple that wasn’t just the same old steaming boredom and come across this recipe which I now bequeath to you. Let it be a wake-up call to us all to pay a little more attention to the side elements of our meals. Done right, they can be very simple preparations which really give a meal extra sparkle. As for the pork chops, I’ll parse out the recipe with measurements, ingredients, and preparation method for you and share in the near future. But for now, get thee a mess of veggies, and serve them with pride. Wait for the eyes to grow wide in pleasure upon tasting. If you’re alone, get a mirror. Watch, and grin knowingly. You have done well. * I rarely have heavy whipping cream on hand and in this case I substituted half and half with no detectable detriment to the dish. * Feel free to substitute a different cheese. Some melt better than others, and cheddar works well, but try what you have and see how it works. * I halved the recipe because my head of cauli was on the petite side, and there were only two of us. To prepare the cauliflower for steaming, pull off the outer leaves and trim off the stem near the base. 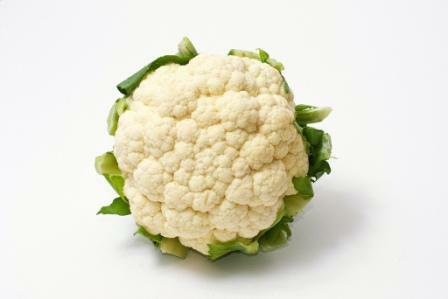 Turn it upside down and use a sharp knife to cut around the core of the cauliflower to remove it. Using your knife, separate the florets from one another, then halve the big ones so that your cauli pieces are all roughly the same size. Place the florets in a steamer basket, and put the steamer basket into a large saucepan with enough water to reach just below the bottom of the basket. Cover and bring to a boil over high heat, then reduce the heat to medium and steam the cauliflower until it’s tender but firm, about 7-9 minutes. In the small saucepan, bring the cream (or half and half) to a bare simmer over medium heat. When it is steaming and just beginning to bubble, turn off the heat and add the cheese, mustard, and cayenne. Whisk the ingredients together until the sauce is smooth, then season with salt and pepper to taste. (Dip a little bit of steamed cauli in it if you need a vehicle for testing the flavor.) Gently toss the cauliflower and sauce together in a serving bowl and serve immediately. Toss in a pinch or two of your favorite fresh herb. Spice it up with extra cayenne. *Thank you to Horia Varlan for the beautiful cauliflower image. This entry was posted on Friday, July 23rd, 2010 at 4:46 pm	and is filed under Dinner, Food, Recipe, Side Dish, Vegetarian, Veggies. You can follow any responses to this entry through the RSS 2.0 feed. You can leave a response, or trackback from your own site. yum yum! how can you go wrong with heavy cream and cheese? Must try this. This sounds awesome! I’ll try this out soon…. I’ve been making cauliflower in place of potatoes a lot lately and will prepare it anywhere from smashed to pureed, but it always gets cream, salt & cayenne. I will have to investigate this cheddar & mustard addition you speak of soon. My kids love cauliflower w/ cheese sauce. Even the dairy-free ones sneak the sauce. I also make a brussel sprouts w/ mustard sauce that they dig. My hubby, Chris, cooked this for dinner last night. YUM! He had also sauted some chanterelles and they slipped into the sauce on my plate–the buttery mushrooms and the creamy sauce were amazing together too. Oh man. I love cauliflower. This sounds phenomenal. Am so making this.